Tom Ribe is a contributor to Writers on the Range, the opinion service of High Country News. He writes in Santa Fe, New Mexico. A memo written by the Trump Administration calls for favoring coal and nuclear power over other industries. 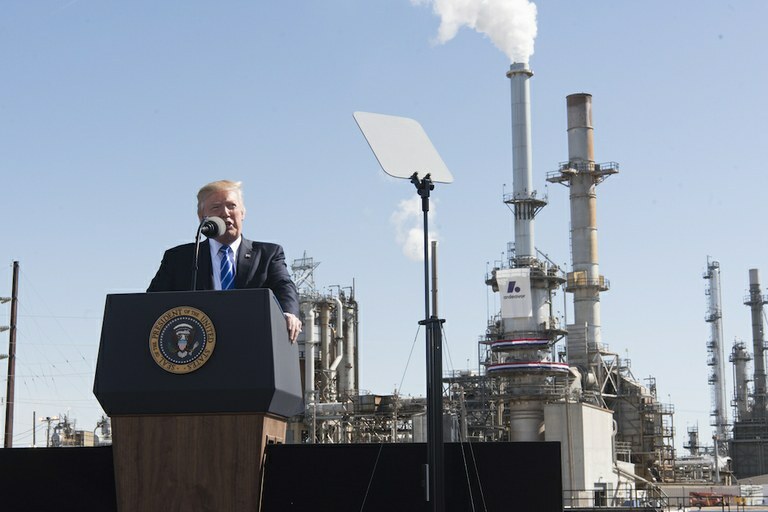 Here, Trump speaks at an oil refinery in North Dakota in 2017. The Nuclear Information and Resource Service, a nonprofit that supports nuclear-free renewable energy, estimates that the coal and nuclear plant subsidies proposed in the memo could cost consumers up to $35 billion per year. Tim Judson, the group’s executive director, said, “Betting on old, increasingly uneconomical nuclear and coal power plants as a national security strategy is like gold-plating a Studebaker and calling it a tank. It could destroy the booming renewable energy industry, which is already employing more Americans than coal and nuclear combined."